I am a dreamer. I catch songs, stories and images as they pass me by. I was born in to this world a pilgrim. I’ve always loved the word itself. “Pilgrim”… “Oilithreach”… “Pellegrino”… “Pèlerin”… “Peregrino”… No matter what the language, the word lingers with me for some reason… I was born in a town called Rosscarbery; Ros ó gCairbre. The wood of Carbery. But long before one man laid claim to the soil, the town was known as Ros Ailithir; the Wood of the Pilgrims. Unfortunately with the loss of the Irish language and the renaming of place into phonetic English, we lose all connection to and story of place. Who knows how far back these pilgrim lines run, but the land is dotted with temples, ring-forts, standing stones, holy wells, sacred spots. Each winter, thousands of birds fly in to rest in the sheltered estuary. A safe haven. The people tell the weather by the Doolic Rock out by the lighthouse; the arrival of swans in to shelter; the rich colours of the sky; the patterns in the clouds; a mackerel sky; which wind blows which way; a ring around the moon; whether or not you can hang your hat on it. We inhabit an ancient wisdom. Pilgrims of this earth. I am a pilgrim of the sea. Growing up, I don’t think I missed one day that I didn't make my pilgrimage to the salty waters of the Atlantic to hear the call of the curlew, the song of the oystercatcher, the churn of the ocean and bear witness to the noble stance of ‘Judy o’ the bogs’ or the elusive egret. I paid homage, daily, to a place that never looked the same twice. Tides ebb and flow; sands shift; rocks emerge and submerge; waters move seaweeds across sands; the moon waxes and wanes; the sun swirls on its spinning axis; birds fly off to sunnier climes; the cliffs reflect different shades of light; waters still; waters rage… The shore - this edge of land - filled my soul full to the brim with awe and joy and wonder and pure enchantment. My church. My place. My home. I never left the Warren unchanged. And always for the better. Cleansed. Filled up. Whole. Blessed. So blessed. “For I come from a saltwater people”, sing the Warumpi Band. I don’t wish to the take the liberty to speak the wisdom of any indigenous nation, but from my time in Australia, it seemed to me that there were two kinds of people on this earth: the saltwater mob and the freshwater mob. And I seem to be most alive when the saline smell of the ocean is pouring in to my lungs and coursing through my veins. The songs I hear are mostly non-autobiographcial, though of course there are parts of me hidden within the lines. But when I hear songs, I hear other people's stories, usually those of women, from another time. Maybe it's something to do with the fact that I went to school at a place called, Lisavaird - Lios an Bhaird; the fort of the bard. Although I was very small, I often wondered about who this bard was, significant enough to name a place after him or her. Was it a he or a she? What stories did he or she tell? Did she recite or sing the tales? What stories were worth the effort of 'writing' them in to the oral tradition? Why was this person held in such esteem by the community? And where are all those stories now? It's so easy to forget that we are just passing through. It's so easy to get caught up in the stress of life and think that we are stuck in a rutt forever. But we're not. Our life is so brief - and we form a tiny thread in a long, long line of his- or her-story. This album is just a short part of mine. My-stery. Growing up, when I whistled around the house, my mum, as her mum before her had told her, would call out, in jest: “A whistling woman and a cackling hen, bring no good luck to the house they’re in”. So, just to break that superstition, some windy melodies have been inserted in where they can! I don’t have any formal musical training. But like the painter, who is self-taught, he or she has eyes to see and a heart to feel and a hand to move and thus express. He or she is no less of a painter. For me the album was the same. Music based on instinct. I have ears to hear and a heart to feel and have always heard music. Song is a form of expression and I love the notion of folk music. Of the people. Of the ordinary. Of the mundane. Self-expression. Not limited those who can read notation and understand theory. Not limited to any identity of being a musician or not. But open to those to can hear it. And feel it. We are all music-makers from the start. There was always music in our house. Like many Irish homes, our days were punctuated by the programmes which streamed through the kitchen radio. A steady friend. Inside the house, we told the time of day by the ring of a certain chime or jingle throughout the room. Nobody was particularly brilliant at music, but everyone was good. And that was enough. Music belonged to everyone and not just to the gifted. There were always instruments in the house to be played with, records and tapes were always on the turn, some tune was always floating from some bedroom, and the pulse of someones foot, taping the floor while homework was being done, could often be felt downstairs. There was always a melody to harmonise to, even if it was just the kettle singing, or a log on the fire releasing. I hope you enjoy hearing the songs, as much as I did the first day. Be the pilgrim on life’s journey! The first and deepest and most sincerest thank you has to go to Mr. Christophe Capewell. 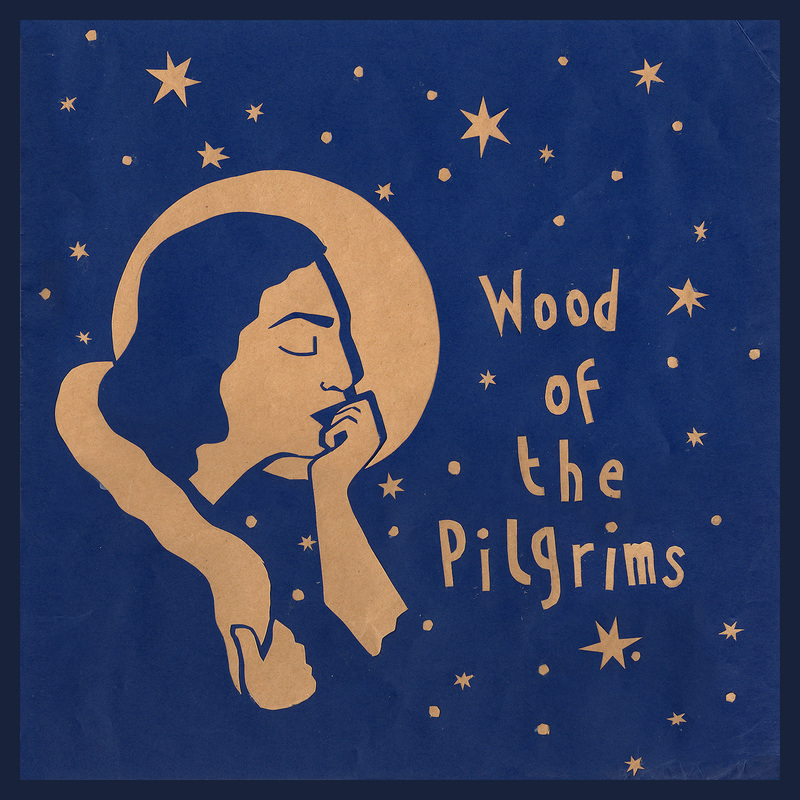 Wood of the Pilgrims would only be floating around inside my head if it wasn't for him. Go to www.christophecapewell.com to check out this genius as quick as a flash. This album just would NOT have been possible without him. With the biggest heart imaginable, and buckets of talent, Christophe provided for me the magic carpet on which I could fly this album. His blind faith in my songs gave me wings, but this faith was backed up with hours of hard work in his studio in his redbrick house, as recorder and producer and multi-instrumentalist, in Dublin town. His sensitive ear heard intricate arrangements to my melodies and harmonies, without us ever having to explain in words what sound we wished to capture. His put his heart and soul in to every minute of his playing and production and sprinkled gold-dust on my music. I’ll forever be grateful Christophe. How lucky to make an album with someone who can play every instrument imaginable, so beautifully, with such heart. When I stumbled upon you and your fellow troubadours making music and magic in a walled, rose garden, as the warm summer sun sank slowly on a solstice evening, little did I know that it would lead to this. Thank you, thank you, thank you. Go raibh míle míle maith agat. I still can’t believe that I have made an album with you! Christophe’s own compositions are absolutely exquisite and I'm sure you'll be hearing much more from this man, who has so many strings to his bow. Now, following Christoph's talents, in order of how they all got sucked in to the song pilgrimage…..
To the Rosscarbery gulls who’s echoey strains open the album and have followed me far and wide, each time, calling me home... Thank you for your song, and for reminding me that we are all just passing through….. Thank you so much to Adam Sinclaire for mixing the tracks and for being a dream to work with! His reputation preceded him and I feel so lucky that he was able to work on Wood of the Pilgrims. (www.adamsinclair.co.uk) Blessed, blessed, blessed so I was, throughout the whole process. Mastered by Kevin Metcalfe (www.soundmasters.co.uk) A huge and sincere thank you. To all those friends and family, far and near, who listened to rough demos via email or text message and pushed me onwards: you know who you are and, hopefully, how much I appreciate the listening ears and open hearts. It’s scary dipping your toes in to the pool of creativity - and evenmore so sharing it - and your words of encouragement spurred me on, no end. Thank you most sincerely. And to you, who read this. Thank you. Thank you for your gift of listening. Thank you from the very bottom of my heart.